How do I change the lamp on my projector? Step 1. Unplug the power cord from your projector and let the lamp cool down. Step 2. Locate the lamp access panel on your projector and remove the screws and access panel. Step 3. Remove any screws holding the lamp housing into the projector. Step 4. Reach in and firmly pull the lamp housing out of the projector. Step 5. Place the new lamp housing into the projector in the same orientation as you removed the old lamp. Step 6. Wiggle the lamp into place and make sure full contact is made inside of the projector. Step 7. Replace the lamp mounting screws to secure the lamp into the projector. Step 8. Replace the lamp access panel and secure the screws. Step 9. Plug in your projector and power it on. Step 10. Reset the lamp counter. Some lamps will reset the lamp counter automatically when a new lamp is placed in. If your projector needs the lamp counter manually reset, look through the projector menus for an option to reset the lamp counter back to 0 hours. If you need additional help replacing your lamp you may refer to this video. how to replace your projector lamp. The projector image seems dimmer than usual - what does this mean? It may be time to replace your projector lamp. Projector lamps will dim down to 50% of their original brightness as they age. Some projectors allow you to check the number of hours your lamp has been used through the built-in menu system. Check your user guide for information about this feature. How many hours will my projector lamp work? Just like any light bulb, projector bulbs have an expected operating time, called lamp life. This value is expressed in hours and represents the number of hours before the lamp is at half its original brightness. The expected life of a lamp will vary based on the lamp technology and the projector; however, most projectors offer about 2000 hours. The lamp's success rate is based on a bell curve, so that a majority of (but not all) lamps will meet the lamp life hours specified. Some lamps will fail sooner and this is part of the acceptable operating range of the rating. For projectors that are used under normal operating conditions (no more than three to five hours per day in a clean, relatively dust-free environment) the lamp will have the greatest likelihood of lasting through its entire rated lamp life. What can I do to help my projector lamp last longer? There are several things you can do to increase your lamp life. Do not allow the projector to become overheated by ensuring that there is adequate clearance near the intake and exhaust vents. Operate your projector in a clean, relatively dust-free environment. Clean air filters every 3 months or more often if there is a lot of dust or contaminants in the room. Striking the lamp ages the lamp as it causes slight changes to the shape of the electrodes that light the lamp, so light up your projector when you're ready to use it and avoid frequent on and offs. Avoid shock to the lamp or projector. If your projector has this feature, Use "Lamp Economy Mode" to lengthen the life of the lamp by reducing its brightness. In most cases you will get a 50% increase in lamp life with a 20% reduction in brightness and you will not likely notice the reduced lumen output. 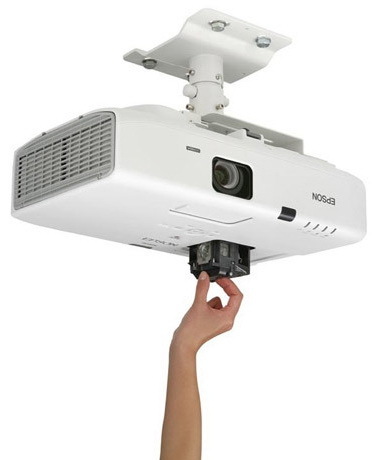 Allow the projector fan to turn off after you power down and before you unplug the projector. The only exception to this is a projector that is designed to keep the fan turning for a brief period after removing power. Where do I buy a replacement projector lamp?